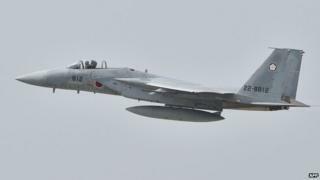 Japan is scrambling fighters at near-unprecedented levels in response to foreign aircraft - mainly Russian and Chinese - approaching its airspace, the defence ministry says. Jets were scrambled 943 times in fiscal year 2014, a 16% increase on 2013. This is just one shy of the record 944 scrambles in 1984, during the Cold War when aircraft from the former Soviet Union were very active around Japan. But no aircraft violated Japan's airspace, the ministry said. Japan's national broadcaster NHK said fighter scrambles dropped to around 150 annually after the Cold War ended. But in recent years tensions between Japan and its two large neighbours have risen - both China and Russia have ongoing territorial disputes with Japan. Tokyo and Beijing are at odds over islands in the East China Sea which Japan controls. A row over islands off Japan's north coast that were taken over by Russia at the end of World War Two continues to dog ties between Moscow and Tokyo. In response to the tensions, Japan has recently started to increase defence spending, reversing several years of cuts.